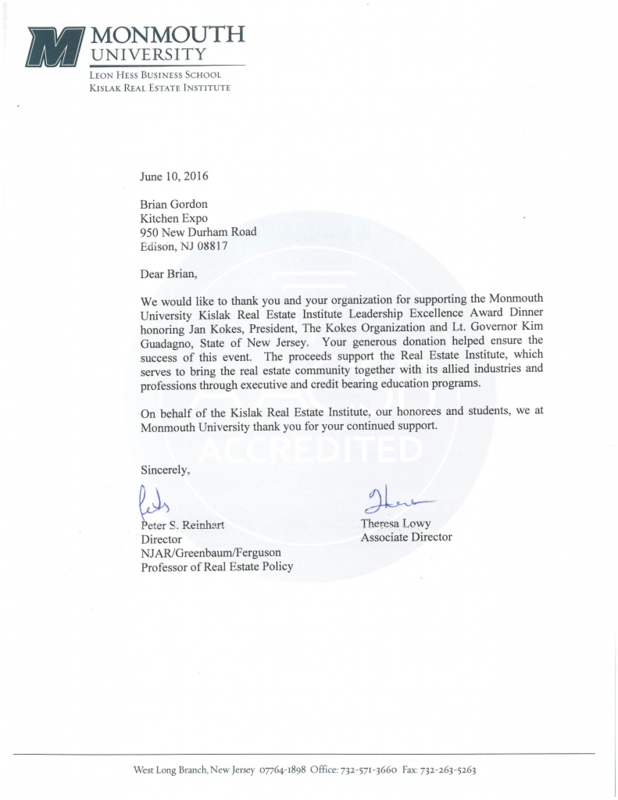 We would like to thank you and your organization for supporting the Monmouth University Kislak Real Estate Institute Leadership Excellence Award Dinner honoring Jan Kokes, President, The Kokes Oraganization and Lt. Governor Kim Guadagno, State of New Jersey. Your generous donation helped ensure the success of this event. The proceeds support the Real Estate Institute, which serves to bring the real estate community together with its allied industries and professions through executive and credit bearing education programs. On behalf of the Kislak Real Estate Institute, our honorees and students, we at Monmouth University thank you for your continued support.